Apotheosis, by Ian Kirkpatrick, 2010. Photo credit: me. 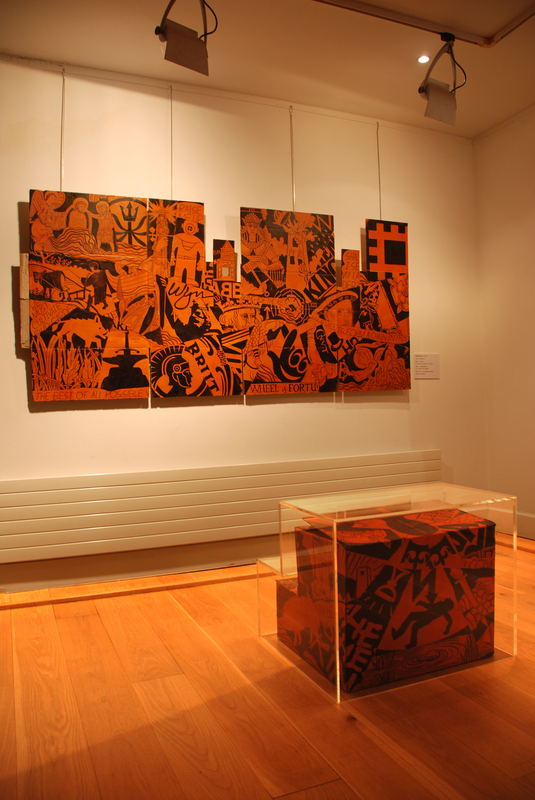 Recently on show at the Link Gallery under the rubric of the Hyde 900 celebrations, it effectively tells the genealogy of what is now the city of Winchester (from Roman times to the present) on shards of cardboard boxes. These boxes themselves come from IKEA — harking back to England’s Scandinavian heritage, and it seems fitting then that his art will soon be going on permanent display in Southampton’s IKEA store. Or you can contact him directly through email. I’ve said it before, but I think it’s important that several of the most interesting archaeological visualisers that I know were trained first as artists. This training often comes to be reflected in their experimental scientific outputs which are not afraid to question the taken-for-granted conventions of archaeological visualisation and, in so doing, challenge practitioners and the broader public to think differently about research on and presentation of the archaeological record. Vasko Démou (another Southampton PhD student, and both an artist and archaeologist) is similarly invested in such work, and I’d love to hear from others with comparable goals.